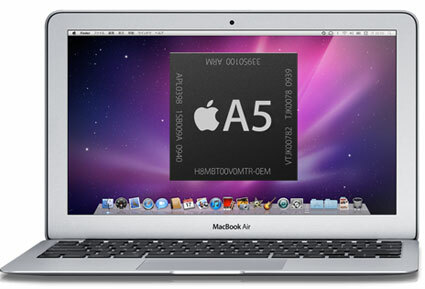 Apple Testing an ARM (A5) Powered MacBook Air? Mac Otakara claims that Apple is presently testing an A5 powered MacBook Air. And additionally, an anonymous source told more information, Apple already made test equipment of Thunderbolt MacBook Air driven by A5 processor. According to this source who saw live A5 MacBook Air actually, this test machine performed better than expected. The A5 processor is an ARM-based processor that Apple uses in the iPad 2. Mac Otakara is uncertain what operating system this experimental machine was running. They also add that Quanta Computer manufactured this test-drive machine. This news comes weeks after another rumor claiming that Apple is planning on transitioning from Intel to ARM-based processors on their laptops in the not too distant future. Most people had dismissed that rumor due to the compatibility issues that would be introduced with such a transition. Another major issue is that while ARM processors are more power efficient, they presently offer significantly lower performance than their Intel counterparts. The Japanese blog has had some accurate information in the past, being the first to describe some of the new physical characteristics of the iPad 2. It is certainly plausible that Apple might be testing such combinations in their labs, though its unclear if/when Apple might actually decide to introduce such a machine. Maybe just an A5 for graphics and openCL purposes since A5 are fully (CPU and GPU) compatible with the standard where Intel current designs only support openCL on the CPU. Ivy Bridge will support OpenCL on the IGP. they might be testing it, but it won't be until a6 or a7 that a solid "desktop" system (as opposed to ios) can be built on arm. Anyone who thinks otherwise is clueless. Heck, all the Linux DEs build on ARM and run fine. They have for years. And all the Linux DEs make perfect "desktop" systems for people who do Web, E-mail, Facebook. Who's clueless exactly ? However, I doubt Apple would go forward with this, especially with a build of OS X for ARM. Too much commercial software to through a whole CPU architecture change again, especially that now they are on Intel, the most popular architecture out there for laptops/desktops. This wouldn't surprise me. Apple has a knack for looking into the future  way into the future in some cases. That doesn't mean that they're preparing for an ARM-based MacBook Air today, just that they're exploring their options for three or four years down the road. Eventually ARM will go 64-bit and add workstation-level features, and Apple is investing a lot of money into producing their own custom ARM-based chips. Keeping their options open for future Mac hardware makes sense. Don't forget, Apple had been producing experimental Intel-based Macs since before Mac OS X 1.0 came out in 2001. But they never made this public until they transitioned to Intel processors in 2005; that's a four year period of experimentation and preparation for a possible future. Apple people owe a debt of gratitude to Intel. During the PowerBook days Steve bashed Intel over & over. Then after he had one of his typical dust ups with Motorola he was desperate. So let's not conveniently overlook the fact that Steve sucked up to Intel and got them to make chips for Apple, thereby saving them. The Hypocrisy of Apple is legendary. One minute the lemmings are bashing Intel, the next its running their Macs. It doesn't get any more hypocritical than that. think is just like Apple and Intel. I'll explain. Apple had OS X running off intel hardware long before the public PPC to intel switch. I'm sure when they started developing OS X for intel they had no need to make it public. Just for their lab testing purposes. But it was a nice insurance policy. If the PPC architecture went belly up Apple would have to spend yeats making OS X work for another architecture. In this case the intel one. But Apple spent those years making it work for intel much before it was even needed. So when it was needed the transition could immediately take place. They didn't have to wait a few years first to make it work them transition. That wait would have killed Apple. And it's the same with OS X on ARM. Will Apple ever release a public OS X for ARM? In the foreseeable future probably not. But if anything happened to Intel and ARM suddenly became the architecture to go with, Apple will have already have made it work so they can immediately transition. Apart from the geek fun factor. It's a little like Apple Care. You probably will not need it. But if on the rare occasion you do need it (The PPC to Intel switch a good example of when they did need it) they'll be so glad they had already did the work in the past. Watch the negative post ratings pile up. You criticized Uncle Steve.